Bollywood fashionista Malaika Arora has expressed here desire to enter the fashion world in Assam with her own brand. 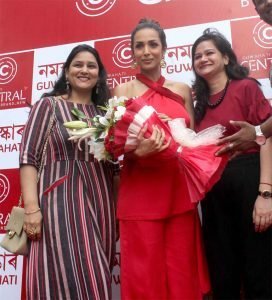 The actress and danseuse was in Guwahati on Saturday for promoting a brand. She said if the people of Assam give her a chance she is keen to enter the fashion world here with her own brand. Malaika, however, opted not to speak much on her own brand. She only assured her fans that she would like to visit Assam again. The B-Town beauty is supposed to visit Kamakhya temple during this tour to Guwahati. She visited Guwahati much before. She said that people here in Assam are fashion conscious, which is why many Assamese people have made their own brands in the fashion world in Mumbai. “On the eve of the Rongali Bihu, I like to wish the people of this state to take the most of the celebrations. Since I’m here on the eve of Rongali Bihu, I would like to make this visit memorable by taking Bihu delicacies like til pitha, narikol pitha etc., along with me,” she added.